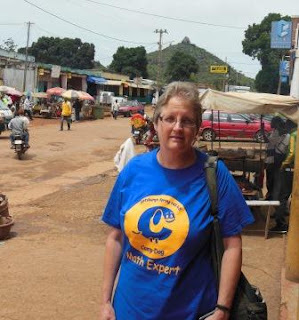 Susan in the Central African Republic: On the Road Again! Leave N’gaoundéré sometime between 8 and 9 a.m.
Drive 4 hours or so – some good, paved roads, some not – to Garaou Boulai, this is a Cameroonian town on the border with CAR. We stopped there for the night on the way here. 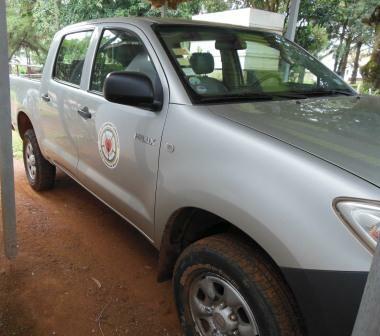 While in the border town, we need to arrange some paperwork so that the Toyota HiLux that will be mine for a while can be driven in CAR. It is registered in Cameroon. After crossing the border (which can take some minutes or an hour), we will drive an hour to Baboua. If the Central African church vehicle is available, National President Golike will drive to the border to meet us and travel back with us. We will stop briefly in Baboua so I can see the house and house where I will stay eventually. Then it’s off to Bouar, a town 2 hours further east. That is where the national church offices are. I will stay there for a couple of days to see what is there and then go ½ hour further north to Bohong. There is a Lutheran clinic there and it is where I will study Sango (though not on this trip). After a couple of days in Bohong, I will go back to Baboua to get ready to go to study Sango. By then, I should have a better idea which parts of the stuff I have I need there and which can stay in Baboua. I will be studying Sango through Oct. and maybe into Nov. We shall see how it goes! I did have a lesson today on how to check fluids under the hood and to find what I (or someone with me J) need to change a tire. Muy interesante todo el recorido, te ves muy guapa con esa camiseta, me alegra poder ver una foto tuya in situs, parece un pais mas pobre de lo que imaginaba. Sigo de cerca tu blog, siempre espero tus noticias. Realmente es grande esa camioneta para ti, pero muy necesaria en este lugar. Cuidate mucho Susana Maria. a truck!... well, well, well!